Classic T-Shirt Quilts are laid out in a grid pattern where each shirt piece is cut to finish at a 13" square. Sashing fabric and borders make these quilts have very classic, clean lines. Prices: $230 + $10 per block; $200 deposit required at ordering. Custom T-Shirt quilts are unique quilts because they are laid out to suit your t-shirts, and they are best for t-shirts that have logos that will not fit in a 13" square. Prices: $400 + $10 per piece; $200 deposit required at ordering. 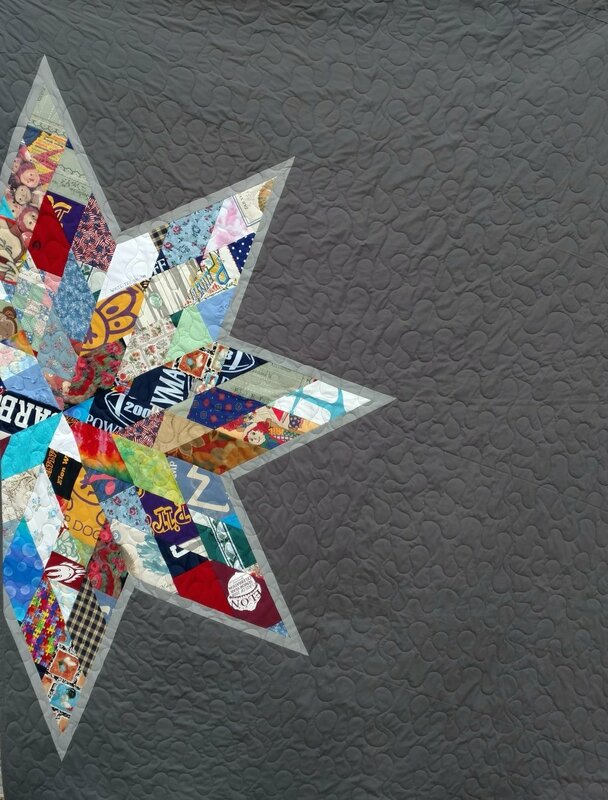 Memory Quilts are quilts made from a variety of clothing, such as women's dresses, wedding dresses, blouses, slacks, and men's shirts. Classic memory quilts are offered in three patterns: Log Cabin, Rail Fence, and Square in a Square. Custom memory quilt patterns can vary. A $200 deposit is required at ordering. Custom Quilts are quilts not made from clothing, and vary in price based on the design and fabric chosen. A $200 deposit is required at ordering for these quilts, as well. Memory Bears can be made from clothing of a loved one and/or 100% cotton fabric to create a one of a kind treasure. Eyes and nose can be buttons or wool, and each one is stuffed with polyfil. Bears can have embroidery on them, too! No Deposit is required. Payment is due when the bear is complete. See the ordering page to get a customer agreement form. Memory Pillows can be made from various types of clothing including ties (See examples in the gallery!). Pillows are made with an envelope back, like a pillow sham, so they can be taken off of the pillow form and washed. Pillows come in 18” or 20” pillows. No Deposit is required. Payment is due when the pillow is complete. See the ordering page to get a customer agreement form. $100-$150 depending on the materials and design.